Jake stood in front of the horses. If anybody saw him they would wonder about him. They’d think he was very strange talking to the horses but he always believed in telling his animals whatever was going on. 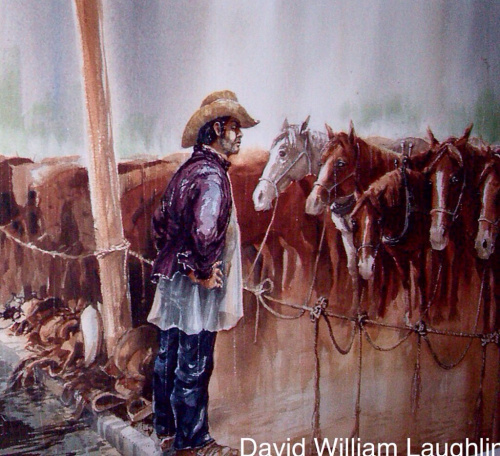 The business of the ranch affected them and their livelihood as well. He thanked them all for their continued support. Goodness, what a prat he sounded he thought. They were horses after all but he continued on with his thoughts. Last night after supper, he told them, I proposed to Mary-Beth and she graciously agreed to become my wife. The horses nodded their heads and whinnied in acknowledgement. One or two of them stamped their hooves gently on the ground. Jake continued, Mary-Beth wants you all to pull the carriage at our wedding. To which statement the horses snorted their laughter at the thought of being primped, pampered and powdered at the whim of this Mary-Beth. We're probably better off not knowing what animals really think. Good one, Sally. Whimsical and fun. Good job, Sally. This really made me smile Sallyl Sounds like he is a "horse whisperer." So cute that the horses "laughed" when he told them they would pull the carriage at the wedding. Great story and thank you for participating in Flash Fiction for Aspiring Writers Challenge! Hope they're careful what they eat that day. Love the laughter, horses do laugh, don't they? I was sure the one that bucked me off his back was laughing! Good tale!